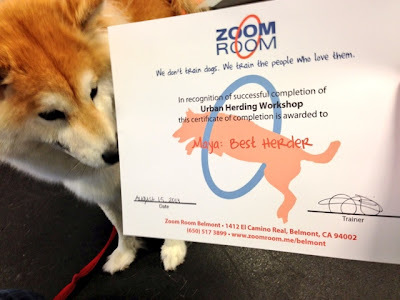 Urban Herding is a 6-week workshop we attended at Zoom Room Belmont since mid-July. 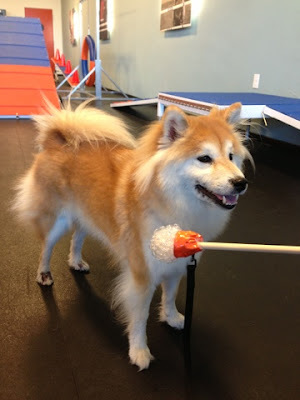 Is is an introductory class for Treibball, where handlers give commands from a distance and the dogs would push a ball around the field towards a goal. During the first class, we started by practicing the touch command, then extended to touching the end point of a long stick. That was easy for Maya, but then it got challenging. We moved on to making her "stand and stay". Out of habit, she would try to sit when I asked her to stay (or when she saw treats in my hand). She also doesn't quite get the idea of standing up from a sit position. After that, the real challenge came when we need to teach her to push a food can with her nose. I tried asking her to touch, which she did, but her touches were too gentle or from the wrong direction and the can never moved. Then she got a bit frustrated and started to bite, lick, or paw at the can, but she just wouldn't push it. And then the big ball came out, which got even worse. She continued with the touching, biting, licking, pawing, and even climbing on it. By the time we walked out of the classroom, we were both exhausted and I had no idea how I'll ever teach her how to push the damn ball. What should I do with the ball? A few days went by without a good solution nor any practice, and then while I was cleaning Maya's toys, I found the Kong Wobbler hidden in a corner. It suddenly came to me that the way Maya plays with the toy is exactly the "push" we wanted. I placed the toy on the floor without even putting any treats in, and she begin to nudge it with her nose right away. I grabbed the clicker and click as soon as she pushed and gave her a treat. After a few rounds, I started add the word "push" as soon as she pushes. Then I changed the toy to a food can and gave her the "push" command. Without any hesitation, she started to push right away. Push, click, treat, push, click, treat! A few minutes later, she's pushing whatever I placed in front of her. What a smart girl! After we got the "push" figured out, the class was much easier for us. Some of the other classmates were still a but confused, so we played a few interesting games, like putting treats in toilet paper rolls and let the dogs unroll them. I would have never imagined myself encouraging my dog to play with toilet paper. However, besides the "push", there are still a few challenges. Making Maya to "go out" to stand and stay behind a target was super hard. She was able to go out to a certain range, but once out of my arms reach, she would just stand there. And once I reach for a treat, she would try to come back to me, or sit down. This is probably because all of her training since puppyhood rewards her for staying close to me or sitting still. She had no idea I why I would want her to leave my side. And then the biggest challenge, is to make her push the ball in the direction I want. Every time she starts pushing, she would enter this crazy pushing mode and ignore whatever I say. Even when she is paying attention to me, it's super hard to make her change directions. 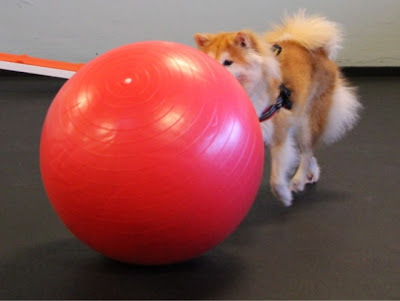 Since the ball is so big, I would need to guide her all the way around the ball to push from a different angle. Usually by the time she got to the right place, the ball most likely had gone somewhere else. Despite all the challenges, Maya still graduated with flying colors. During the last class, we had to compete in 6 different contests, including going out behind an object, moving to target locations, unrolling toilet paper, pushing the ball for a certain distance, pushing the ball to a "gate", and, oops, I forgot the other one. Maya won 4 out of the 6 and tied the other 2. She walked away with the "Best Herder" title! 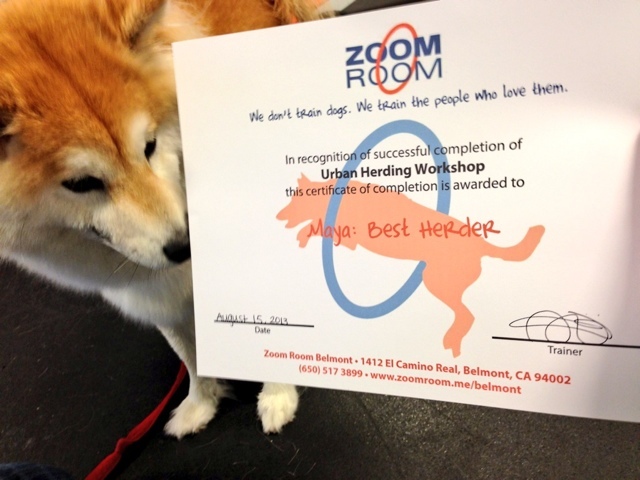 Maya graduated as the "Best Herder"!! Overall, it's a very interesting workshop. It would require a lot more training to even think about competition, but it's a great introductory class to have an understanding of what Treibball is about. Though is not as physically challenging as agility, it actually provided a lot more mental stimulation. 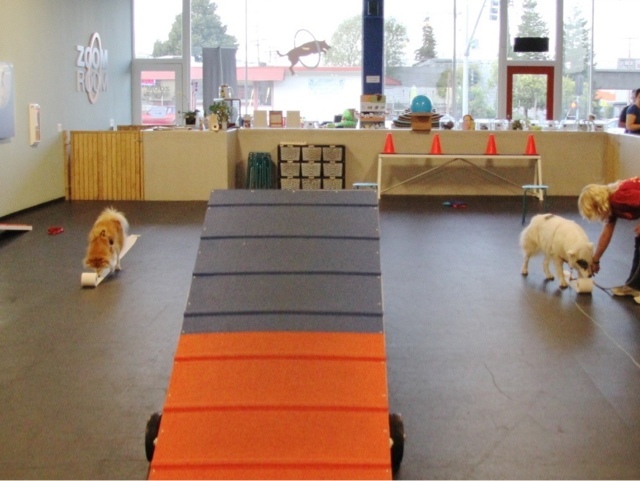 We had to constantly take breaks during the class so the dogs wouldn't be overwhelmed. This class also provided a great opportunity for me to really learn how to use clicker training. It worked really well when marking a precise action, like how to push or touch. However, it doesn't work well when doing a continuous motion, like moving to a location, pushing the ball for a distance, or standing still for an amount of time. 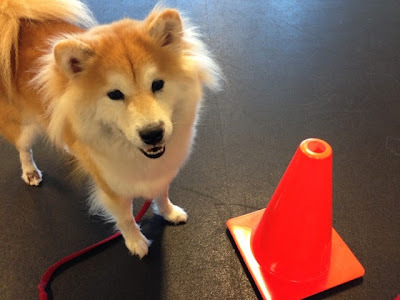 The sound of the clicker was too distinct and Maya would stop whatever she's doing and wait for a treat. Verbal acknowledgement actually works better in those cases. The best part about this activity is that we can continue the training at home. 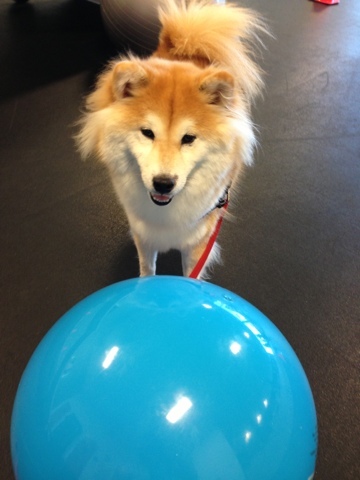 All we need is a ball and some enthusiastic "Push! Push! Push!" commands!